China is preparing for the week long National Day holiday next week while sellers are trying to keep the market firm with their October price hike targets as per the pricing service of ChemOrbis. “We plan to stand firm on our PP prices to China as our availability will be limited for October. We will reduce operations at our plant rather than agree to discounts as we are not satisfied with our operating margins,” a source from a Southeast Asian producer reported. A global producer also raised its Saudi PP offers to China by $20/ton for October pointing to their tight availability. While sellers are still trying to keep the market firm in China, the Turkish market has already moved out of balance with the netback to China. Persistently stagnant demand is cited as the main reason behind this situation. The long expected revival in demand has not occurred in September while buyers are now waiting for the upcoming Eid holiday in mid-October, which is expected to curtail polymer demand further. Hence, PP and PE buyers in particular have started to voice softening expectations for next month. 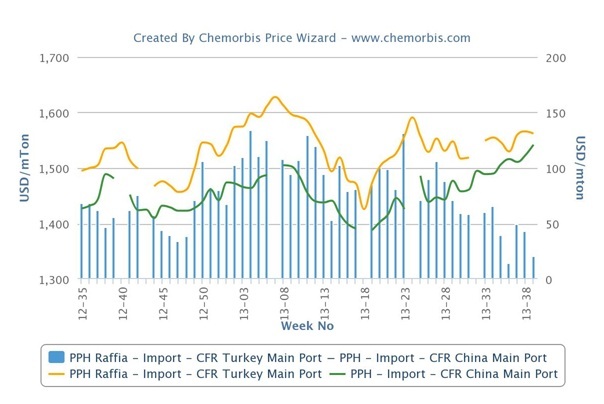 As can be seen from the graph below, Turkey’s PP raffia market is still carrying a premium above China as it should be, given Turkey’s relatively smaller market share and freight difference. However, this premium has been almost at a year-low recently. 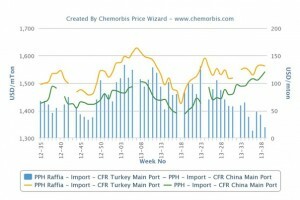 According to ChemOrbis, in order for these two markets to move back into balance, there are two possibilities: Either Turkey will have to face higher import prices or China will need to come lower. Players are now closely eyeing the developments in the upstream chain as well as the state of demand to cast a clearer opinion for the near term.